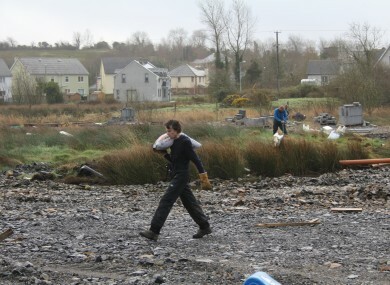 Group of friends urge fellow citizens to help Ireland’s 600 ghost estates return to nature rather than blight the landscape – Frank Armstrong describes one guerilla planting session in Co Leitrim. NAMA to Nature plants trees on Waterways ghost estate at Keshcarrigan, Co Leitrim. A GROUP Of friends has taken an innovative approach to the eyesore of one ghost estate: by planting trees on it. NAMA to Nature – an idea thought up by Andrew Legge and Serena Brabazon – has a Facebook page which records its work with the message: “Ireland has over 600 ghost estates and 40,000 empty dwellings. Rather than watch the government dither and procrastinate let’s help nature take them back.” Legge says the Facebook page is simply to document what he and his friends did on one estate in an area of Leitrim that has personal meaning to them – and encourage others to repeat the action in their part of the country if they see fit. ON THE WALL outside ‘The Waterways’ in Keshcarrigan, Co Leitrim a series of images with the caption ‘Boating from your back door’ survive. It features families frolicking on marinas and an overhead picture of how the estate will look. This could easily be the work of an artist lampooning the Celtic Tiger. But there is no irony intended. It is the real deal, an enduring monument to greed, folly and hubris. I am an unlikely activist and I acknowledge the importance of abiding by the law. But there are exceptions. For example I would steal a loaf of bread to stay alive and our Constitution states that all rights including those to property are subject to the common good. A community can justifiably abate a nuisance. At about 10am two members of An Garda Siochana rolled into the estate in a large transit van, expecting trouble perhaps. When asked who we were and what we were doing we replied that we were private individuals planting trees on public land. The gardai seemed confused. Then another car entered the property. The two gardai briefly left us and had a discussion with the driver who it transpired was a former caretaker. Upon hearing what we were doing he told them he had no problem with it. The developer had left him high and dry. I wonder how many lonely cups of tea he drank in that portakabin before deciding that enough was enough. The gardai were still perplexed and the exchanges became increasingly jovial. A garda took the numbers of three of the participants, one of whom warned the garda to refrain from any late night texting. The young man, who had the healthy glow of a Gaelic footballer, blushed slightly; the other was finding the whole affair increasingly amusing. The pretty tree-planters would make a good story for the boys back in the station. We strongly advise anyone participating in a project such as this to exercise the utmost caution in ensuring the health and safety of themselves and those around them, and to refrain from any damage to the property therein. We also encourage everyone to respect the gardai and seek the co-operation of the local community if they come from outside it. The objective is simple: help nature restore life by planting trees on scarred landscapes. Email “Nama to Nature: Why we are planting trees on ghost estates”. Feedback on “Nama to Nature: Why we are planting trees on ghost estates”.